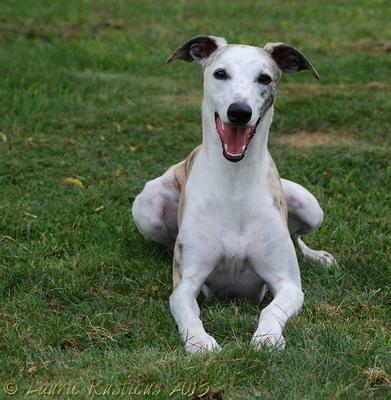 Swiftsure Whippets is located in Aldergrove, BC, Canada. We have participated in all whippet activities - lure coursing, straight track racing, oval racing, obedience and the show ring in both Canada and the US. Join in and write your own page! It's easy to do. How? Simply click here to return to Whippet Breeders. Hounds of Vrymeer is located in the scenic Land O Lakes region of Ontario Canada. Vrymeer produces quality Whippets from a combination of sound championship pedigrees, ANNUAL health testing, selection for breed type and above all temperament. Versatile well-socialized pups are born and reared underfoot in our kitchen and are available to approved homes on occasion. We do not breed often, reservations are recommended. 5 year guarantee, lifetime support. Join the Vrymeer family! Our mascot Rockstar Rusty is Silver Level American Grand Champion/Canadian Champion Vrymeer Delivers Unobtanium. An American Whippet Club Top 20 whippet, Rusty was ranked #4 male in the US in 2011. Rusty's sire Spex was Canada's #1 whippet in 2000 (Am/Can Ch Baccarat Special Delivery).